Fair Housing Act Supreme Court ruling: Anthony Kennedy and the court acknowledge that disparate impact is real. The Supreme Court takes a stand against housing discrimination. 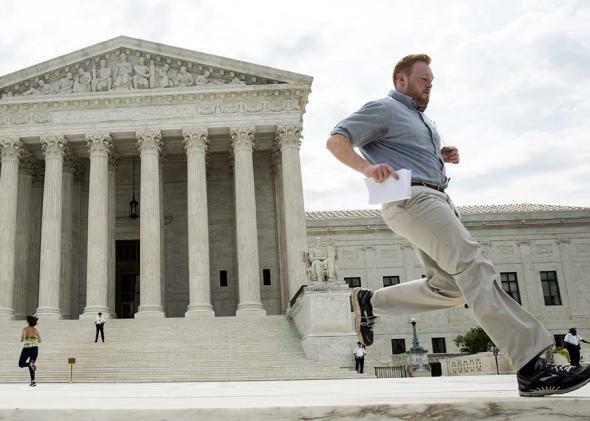 An intern runs to hand off the decision in Texas Department of Housing and Community Affairs v. the Inclusive Communities Project at the Supreme Court on June 25, 2015. On Thursday, in a 5–4 opinion written by Justice Anthony Kennedy and joined by Justices Ruth Bader Ginsburg, Stephen Breyer, Sonia Sotomayor, and Elena Kagan, the Supreme Court held that the 1968 Fair Housing Act—passed in the wake of Martin Luther King’s assassination, huge riots, and urban destruction—allows federal action against “disparate impact” as well as overt discrimination. This ruling not only affirms an essential tool in combating racial discrimination, it upholds the view that racial disparities are a national problem that the government ought to combat. Disparate impact—the idea that, whether intentional or not, something is discriminatory and illegal if it has a disproportionate “adverse impact” on a particular group—is easy to understand, on account of its universal presence in the United States. Explicit racial bias is frowned on and most Americans strive for tolerance and fair treatment. Yet, there are vast racial gaps in almost every part of American life, from incarceration and the criminal justice system, to education, health care, and even air quality. While it’s tempting to blame “personal responsibility” or a nebulous “culture of poverty,” neither can explain broad trends of racial inequality that snare minorities of all education and income levels. Put simply, racism is so embedded in the structure of American society—from how we distribute wealth to how we determine punishment—that neutral, “colorblind” actions can easily produce unequal, racist results. As part of [its] mission, the [Inclusive Communities] Project tries to help lower-income African-American families find affordable housing, for which they receive subsidies in the form of a voucher, in the mostly white suburbs of Dallas. To do so, those families have to find a landlord who will accept the voucher; most private landlords decline to do so, but landlords who receive federal tax credits for lower-income housing are required to do so. Those tax credits are distributed by state government agencies, such as the Texas Department of Housing and Community Affairs. Because the state agencies determine where to allocate the tax credits, they can affect the housing options available to lower-income families like the Project’s clients. In 2008, the Project filed this lawsuit against the state agency. It argued that the agency had allocated the tax credits in a racially segregated manner: it disproportionately granted the housing credits in minority areas of the Dallas region, while at the same time disproportionately denying them in white areas of Dallas. To be clear, the court hasn’t struck a blow against housing discrimination, it has just maintained the status quo. While the Obama administration has been more aggressive with the Fair Housing Act than its predecessors, there’s still tremendous work to do before the United States has a genuinely fair housing market. But this ruling clarifies the FHA and preserves its broad scope for action. It’s also important to note one final thing: Among the towns involved with the Inclusive Communities Project was McKinney, Texas, where earlier this month a pool dispute—sparked when a white patron told black guests to “go back to Section 8 housing”—turned into yet another instance of police brutality as an officer pinned a teenaged girl to the ground and arrested her. McKinney is divided along an east-west line. Blacks are on the east, whites are in the west, and the pool—a private communal facility—was located on the white side of town. In standing with the project, the Supreme Court did more than uphold the Fair Housing Act, it sent a message: This kind of exclusion—this kind of treatment—is unacceptable.